What Is DA Form 1059-1? DA Form 1059-1, Civilian Institution Academic Evaluation Report is a form used for recording the evaluation of Soldiers pursuing an education in a civilian educational facility. 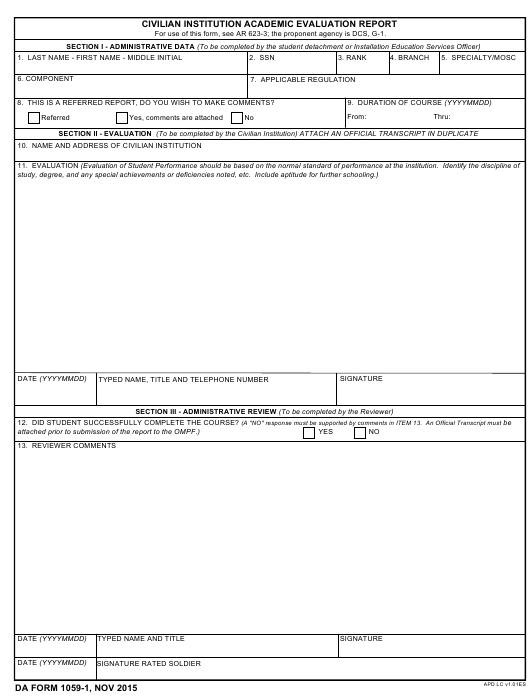 The 1059-1 DA Form was last revised by the Department of the Army (DA) in November 2015. The form is often confused with the DA Form 1059, Service School Academic Evaluation Report, and is sometimes incorrectly referred to as the DD Form 1059. A fillable up-to-date version of the DA Form 1059-1 is available for download and digital filing down below or can be found on the Army Publishing Directorate website. Who Signs a DA Form 1059-1? To be valid, the DA 1059-1 must be signed by the representative of the civilian educational institution that the rated Soldier has attended or is attending. The space for the signature is provided at the end of Section II. The form also requires the signatures of the reviewer and the rated Soldier at the bottom of the form. A Senior Army Advisor, the Soldier's supervisor, an Academic Advisor, or a Professor of Military Science may act as raters during the evaluation. All signatures and reports are reviewed by the Army Community Service Office. How To Print Da Form 1059-1? 8. THIS IS A REFERRED REPORT, DO YOU WISH TO MAKE COMMENTS? 12. DID STUDENT SUCCESSFULLY COMPLETE THE COURSE? The U.S. Army Soldier Support Center initiates the Evaluation Report and provides copies of the form to Active Duty Soldiers attending classes at civilian educational facilities. All Soldiers completing courses at civilian institutions on a Permanent Change of Station (PCS) for at least 20 weeks will be required to participate in the evaluation. Section I contains the personal identifying information of the Soldier and is filled in by an Installation Education Services Officer. Section II requires the name and address of the institution, the personal data of its representative, and a full description of the Soldier's performance according to the regular standards of the institution. This part is completed by the authoritative representative of the civilian institution. The last section is for an administrative review and a conclusion on whether or not the Soldier has successfully completed or failed the course. If the Soldier participates in a long-term civilian educational program (a program over 12 months long), an interim Form DA 1059-1 must be filed 12 months into the course. New reports should be prepared annually up until the end of the program or course. The DA Form 1059 can be filled digitally and submitted to usarmy.knox.hrc.mbx.opmd-army-acs@mail.mil or printed and mailed to the Advanced Civilian Schools Branch (AHRC-OPL-C) at 1600 Spearhead Division Avenue, Dept. 290, Fort Knox, KY 40122-5209.